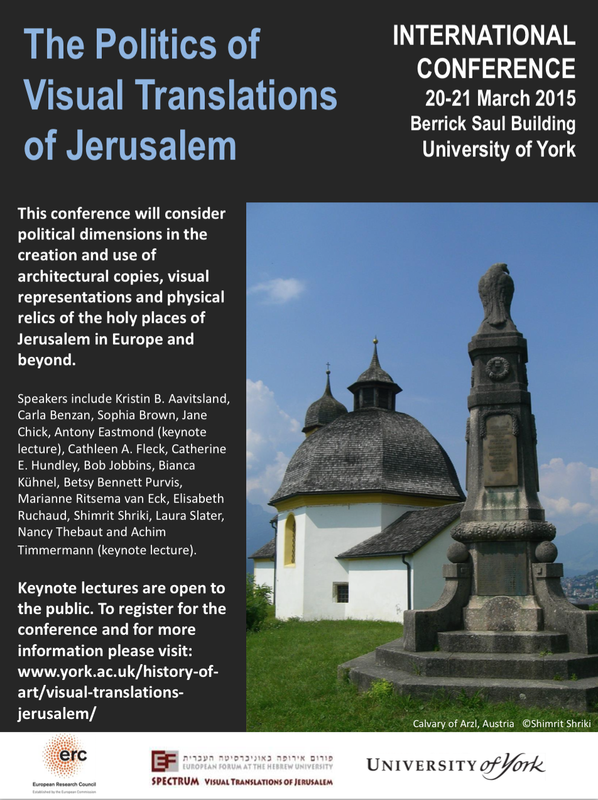 This conference will consider the political dimensions in the creation and use of architectural copies, visual representations and physical relics of the holy places of Jerusalem in Europe and beyond. Ranging from the medieval period to the present day, papers will cover topics including the importance of Jerusalem for the image of rulers, the role of Jerusalem in public rituals and punishment, the appropriation of Jerusalem sites as war memorials and the role of Jerusalem translations in current political debates. Speakers include Kristin B. Aavitsland, Kobi Ben-Meir, Carla Benzan, Jane Chick, Antony Eastmond (keynote lecture), Cathleen A. Fleck, Catherine E. Hundley, Bob Jobbins, Bianca Kühnel, Betsy Bennett Purvis, Marianne Ritsema van Eck, Elisabeth Ruchaud, Shimrit Shriki, Laura Slater, Nancy Thebaut and Achim Timmermann (keynote lecture). The keynote lectures are free to the public. To register for the conference please see our conference website which also includes the full conference programme and abstracts.